Tadanari Lee (李 忠成, Lee Tadanari, born December 19, 1985) is a Japanese professional athlete. He is best known as an association football player. 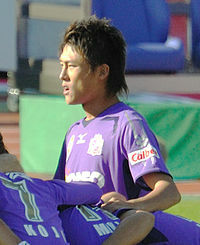 He was a member of the Japanese national team. ↑ National-Football-Teams.com, "Lee, Tadanari"; retrieved 2012-9-6.